In the second week of its 2015 spring season, ODC, the San Francisco-based dance company that takes its acronym from its origins as the Oberlin Dance Collective, presented two world premieres that move into those worlds of politics and social responsibility. 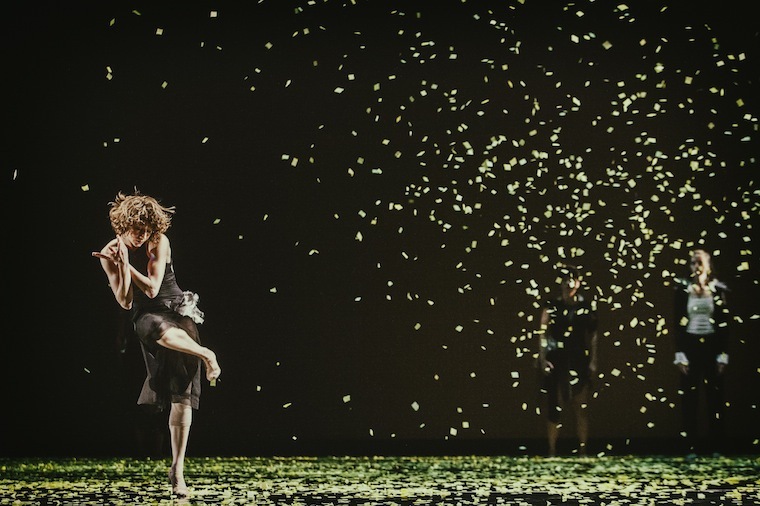 Presented at the Yerba Buena Center for the Arts Theater, these two company pieces prove that dance can serve unerringly – and exquisitely – the cause of social relevance. The piece opens with the 10-dancer company spaced on the open stage moving in frenetic large movements. Later, dancers Yayoi Kombara and Jeremy Smith dance a lyrical and lengthy duet. Dancers enter and shift interactions. Their movements are powerful, dynamic and earthy. The company ascribes more to school of modern dance rather than ballet, though its clear everyone’s training is eclectic and, in the style of the moment, demanding both in the scope of the individual’s movements and in endurance. Half way through the piece, a dancer climbs a small staircase position in an upstage corner to drop torn pieces of paper, like confetti, through the bright white of a small spotlight. The paper flutters like snow onto the stage. The simplicity of the gesture is breath taking. More dancers join this Jack Frost. Eventually, the dancers, women on men’s shoulders, distribute an endless snowfall to the stage. More snow falls slowly down from above the stage, until the entire stage floor is covered. This elegant snow concept belongs to Kombara, and it transformed the work, moving it into the poignancy of the ephemeral, the transitory, and the silent. Joan Jeanrenaud, the former cellist for Kronos Quartet, composed the music in collaboration with the choreographer. At the end of the piece is a rending sound effect that is noted as being the “sound of trees falling and the shattering of bark echoing”, but which sounded to me like the avalanche of ice caps falling. The second half of the program was The Invention of Wings by ODC founder and artistic director Brenda Way. Adapted from an onsite performance as part of Ai Weiwei’s exhibit at the abandoned federal penitentiary on Alcatraz Island (http://www.for-site.org/project/ai-weiwei-alcatraz/). The performance began outside the theater before the onstage performance. Members of ODC Dance Jam, the teen company affiliated with the professional group, were filmed writing messages on a long strip of white paper, some 6-feet wide and 50-feet long. They wrote about freedom, art, and their personal sense of how those are linked expressively. At the beginning of The Invention of Wings, the paper strip runs across the stage from upstage to downstage. It rests on an unrolled red fabric. As the piece begins two dancers tear the paper into bits, crumpling the pieces and throwing them into a black-wire birdcage. Another dancer wheels the cage off stage and the two girls dressed in white collapse onto the proscenium of the stage. Language has been crucial to lives of imprisoned artists, who across the world have been saved – or not – from execution by the words they have written or that have been written on their behalf. At the end of the piece, a woman rises up from the proscenium, dressed in an enormous white dress covered with words in black. She rises up like some organic goddess above the dancers and stage. Often the imagery used in this multimedia work borders on the heavy handed, but the dancing is so infused with grace, the photography so powerful and the timing between events so skilled, that it works. The audience is able to accept the political message of the art unreservedly in the spirit it was intended and be moved.